Fashioned out of a gritty urban edginess, Dan Donaghy's poems relentlessly happen at the conjunction of past and present. People lose things, they watch their fathers abuse their mothers, they are forced to step in harm's way, young boys strut and act like big shots, "Blowing off work./Not knowing what can't last." In "Cinderella and Middle Age," a woman wakes "...each morning to another midnight/with no way home from the ball." In "The Nature of Memory and Fireflies," an unsettling poem in which a mother "crushed (a firefly) in her palm,/smeared her finger with phosphorus/to trace the lines of (her son's) cheekbones," at which he cries out, "...I didn't catch it for that./I said I wished she were dead,/told her to get out, listened to her shuffle/back through the dark to her room." 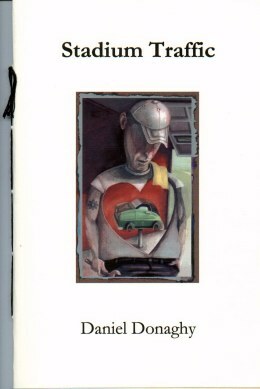 Donaghy's poems go way past anecdote, and, thankfully, the confessional ego is not present. He writes with unswerving restraint, honesty and directness toward his subject matter, and in poem after poem one recalls W. B. Yeats' "character isolated by deed." No one's going anywhere soon. It's mid-July: eighty and humid. wear the ache of dock crates in your back. what they have: time to go to ball games. all the way to the corner and back. wound tight as a fist. from your cooler and pound it. You get back into your car. it would have blown last year. nights while your lady works days. and you've had enough close calls. is barking, a husband is coming home. Daniel Donaghy grew up in the Kensington section of Philadelphia. He earned a B.A. from Kutztown University, an M.A. from Hollins College, and an M.F.A. in Creative Writing (Poetry) from Cornell University. He has received fellowships from the National Endowment for the Humanities, the Constance Saltonstall Foundation for the Arts, and the Cornell Council for the Arts. His poems have appeared in various journals, including The Southern Review, Poet Lore, Alaska Quarterly Review, Texas Review, Commonweal, Image, New Letters, and West Branch. He lives in Spencerport, NY, with his wife and daughter. Stadium Traffic is a 32 page hand-sewn chapbook.